The SDG Leadership Forum for Goal 12 (Responsible Consumption and Production) was hosted by C&A Foundation and GlobeScan on Wednesday 12th September. 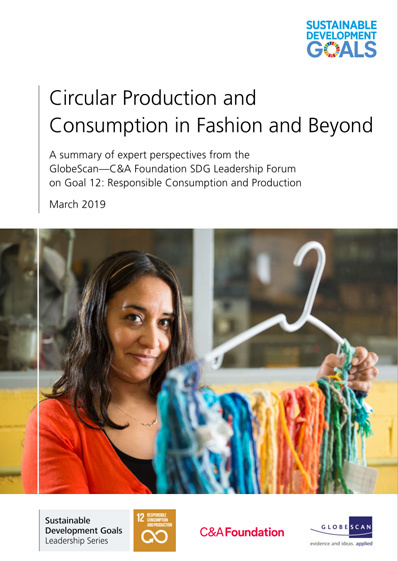 In this live, online discussion, we brought together brands, manufacturers, funders, innovators, academics, NGOs and government to explore how we can accelerate our transition to a circular economy – at pace and scale – inside and outside the fashion industry. We were joined by expert guest contributors as well over 250 participants from 33 countries around the world. You can still access the discussions by logging in on the right hand side and then clicking on the discussion topics. We will also share a summary report with all registrants in the coming weeks. These online conversations provided a wealth of learnings, inspired fresh thinking and collated best practice examples to help us all to turn our ideas into actions for SDG progress. This event was the fourth in GlobeScan's SDG Leadership Series. To find out about the other events in the Series please visit GlobeScan's website here. Please note that all of our SDG Leadership Forums can be accessed with the same log in details - there is no need to re-register for each event.